Field 4 - Rick Parcher Field Closed Get Directions Notes: Fences 250+; Suitable for Pony Boys & High School Boys Baseball - Infield grass. Field 6 Closed Get Directions Notes: Fences approximately 150’; Suitable for T-ball, Clinic Baseball and Clinic Softball. Okay for practice drills. 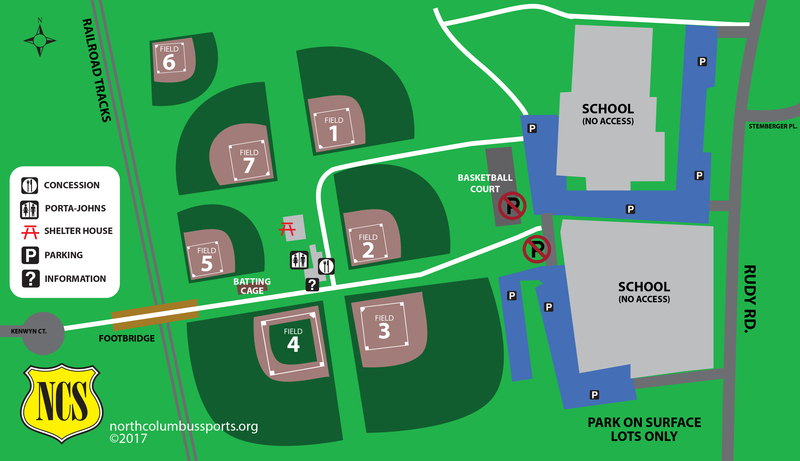 North Columbus Sports is located behind Ridgeview Middle School at 4241 Rudy Rd, Columbus, OH 43214. Note, our mailing address is P.O. Box 20174, Columbus, OH 43220. Do not send mail to the above address, it will be returned.